Rosacea (lat. rosaceus = rose coloured) is one of the most common skin diseases in adults. An estimated 4.7% of the population in Switzerland are affected. Rosacea is also called acne rosacea. This disease more commonly affects people with light skin and in middle age. Skin changes associated with rosacea mainly occur in the face and can thus be a severe burden to those affected and seriously affect their quality of life. Rosacea is a chronic disease that involves relapses with varying development of skin change. The exact cause remains unknown. However, it appears that inflammatory processes and a genetic predisposition play a role. The preliminary stage of the disease involves relapses and facial reddening that rapidly abate again and are triggered by a variety of stimuli. These include UV light, chemical compounds such as cosmetics and soap, heat or cold, spicy food, hot drinks, alcohol and psychological stress. The cheeks, nose, chin and forehead are commonly affected. The regions immediately around the mouth and eyes are usually spared. 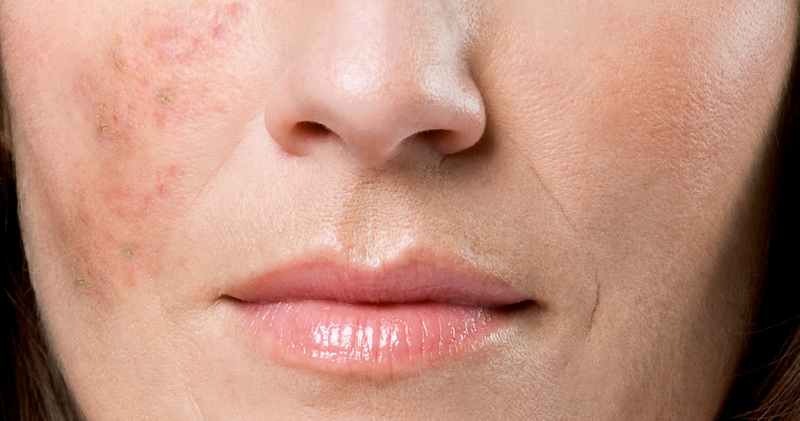 Over the further course of the disease, facial reddening may persist (erythema) and be accompanied by visibly distended blood vessels in the skin (grade I, erythematotelangiectatic rosacea) (see image). Grade II rosacea (rosacea papulopustulosa) involves the development of papules (nodules) and pustules (blisters) and burning of the skin or piercing pain may occur, in addition to the persistent reddening of the skin. Grade III (glandular hyperplastic rosacea) involves proliferation of the connective tissue and sebaceous glands (hyperplasia). Nodular thickening of the nose may also develop (rhinophyma), whereby almost exclusively men are affected by this change. This is often commonly misinterpreted as "drinker's nose". Rosacea can also manifest in non-specific eye symptoms such as a sensation of having something in the eye, burning or weeping eyes or reddening of the edge of the eyelids (ophthalmorosacea) in some of those affected. These symptoms may also occur prior to the skin changes, which is why they are often missed. The symptoms of rosacea are now regarded as treatable, while a permanent cure has still not been found. Options for treatment include topical measures, on the one hand. 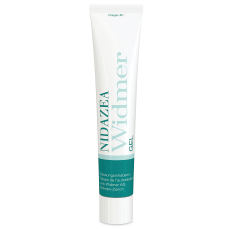 Various creams, gels and lotions are now available that must be applied to the affected skin on a regular basis. These are mainly used during the preliminary stage of rosacea and during grades I and II. On the other hand, grade II and III diseases can also be treated systemically (internally). Antibiotics in tablet form are usually used in these cases. Cosmetic products for cleansing the skin and skin care are also recommended as supportive measures. These must be tailored to the current state of the skin and to the requirements of the sensitive skin that tends to be irritated in cases of rosacea. Finally, reddening of the skin can also be covered using tinted skin care creams or make-up. The choice of skin care product or make-up must always be discussed with the attending physician in cases of rosacea. This medicinal product is only available on prescription. Please contact a medical professional and read the package leaflet. Ensures the skin appears fresh, natural and smooth. Fine wrinkles are smoothed and pigmentation disorders adjusted after regular, long-term use. In addition, it acts as a moisturiser and protects from UV light. The emulsion is available in two tints and gives the skin a fresh, natural appearance.